“How do you create a competitive advantage for business partners by delivering fast access to high quality data, instilling confidence and supporting data driven decision making?” asked Ursula Cottone, Chief Data Officer (CDO) of Citizens Bank. 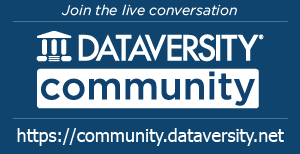 As the keynote speaker at the DATAVERSITY® Enterprise Data Governance Online Conference (EDGO), she tackled this question in her presentation. This question can seem insurmountable when creating and implementing Data Governance strategies for all of Citizen Bank’s enterprise data. With assets of $151.4 billion and information pertaining to over 5 million individuals, institutions, and companies, primarily in the Northeast, it’s an extensive portfolio. Cottone remarked, “When the word Data Governance gets used, it automatically brings into play concepts like ‘control’, ‘security’, ‘protection’, and ‘compliance.’” Then such concepts as ’usage’, ‘functionality’ and ‘innovation’,” seemingly put overall Data Management in opposition to Data Governance goals. As a Citizen Bank’s CDO, Cottone is tasked managing data assets in line with the banks tagline: “We are Citizens helping Citizens reach their potential.” This is a tall order, requiring Cottone to draw on her 16-year experience elsewhere in the financial industry, including providing vision, strategy, and policy guidance for data acquisition, usage, and management activities. In addition, Cottone acknowledged success means, “driving operational efficiency, maintaining growth in revenues and spurring real new insights and innovation within the company with reduction in risk”. As a first step, Cottone owned and took charge of Citizen’s Data Management Policy, not just Data Policy. This required bringing Data Management and Data Governance together. Here, Cottone thinks, comes the balancing act between Data Governance, setting policy and procedures to ensure things are done in a proper way, and Data Management, doing the right thing the right way. She acknowledged the challenge in “finding the right spot there between the two.” She sees that her “driving towards usage and enablement has put us at risk from a governance perspective.” But she believes “that people will do the right thing when you get the right tools, put the right guardrails up.” To create this equilibrium, Cottone described a three-way partnership between technology, enterprise data, and business. 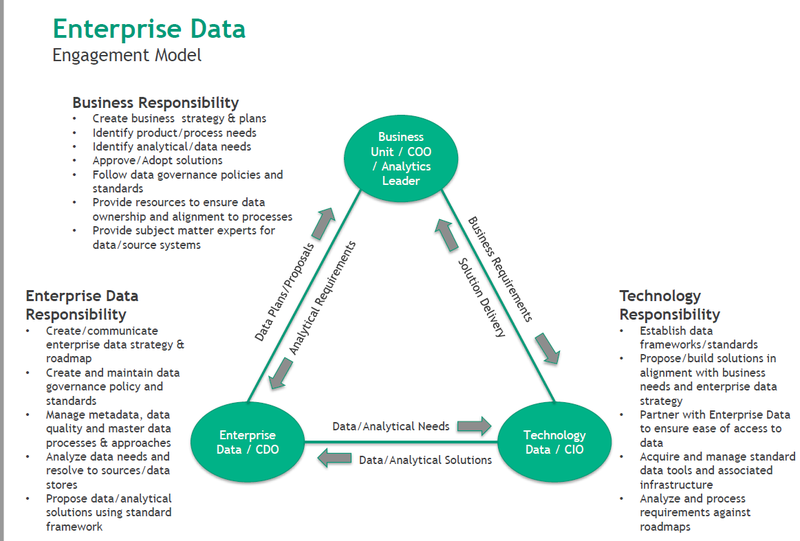 Cottone explained how she manages data through an Enterprise Data Engagement model, as pictured below. Cottone described the matrix as, “a federated model” where all technology is centralized. Technology, at Citizens Bank, plays a “dual role.” Cottone said that technology collaborates on data infrastructure at the same time as aligning themselves with business. Business, in return, provides requirements and resources to get data for any of their existing projects. Enterprise Data builds out the data infrastructure needed by the bank. 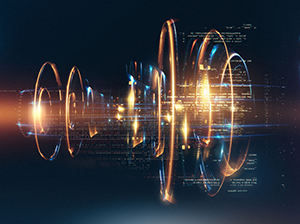 Enterprise Data helps technology build this data infrastructure and ensure business can leverage the data environment to support business projects. 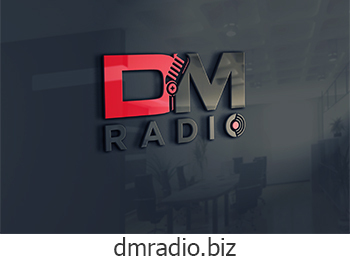 Data Management’s engagement works along with the Data Governance Model. Data Governance at Citizen Bank happens from top down and bottom up, she said. Data glues this bi-directional architecture, including two different kinds of Data Stewards, Data Trustee Board, a Program Steering Committee and ultimately, the Executive Committee Data Governance model. The Data Governance Model below, shows people involved with Data Governance at Citizen Bank and their data related activities. Cottone emphasized Data Stewardship as the “base in the data foundation” of Data Governance that relies on two different kinds of Data Stewards: Source Stewards and Customer Stewards. Both types of stewards raise issues, participate in technological implementations, and work with Business Unit Data Trustees. “They get their hands dirty and help make decisions as a group,” related Cottone. All Data Stewards help, “prioritize issues and communicate back into their organization,” said Cottone. These people “actually get their hands dirty,” and “spend time on data related topics on a regular basis,” she explained. Customer Stewards, a set of 15 people, “think more about the customer as supposed to what line of business they are in,” she noted. These folks conceptualize the customer segment holistically, based on access to all the products that these users have. This type of customer information is stored in a Customer Master. Customer Stewards do a ton of Data Quality work with the customer. However, as mentioned in the paragraph above, Customer and Source Stewards engage in the same processes. Data Trustees get the Data Stewards to engage and assist with ongoing management with both groups. Data Trustees communicate information to the Program Steering Committee (PSC) that will help the PSC “review financials and project statuses.” The PSC budgets for the overall data program. Issues that cross business lines and cannot be resolved flow up to the CEO and his direct reports, who act as mediators for these issues. Moving from the top down, executives identify sources to bring into the Data Lake and their priority, described Cottone. The PSC helps bring in these sources and in which order. They also identify someone to assist in making decisions about challenges with the Customer Master, due to “two different competing points of view from a customer standpoint.” As data moves into the Data Lake, the steering committee prioritizes the many issues, “especially when the trustees are out in that block,” said Cottone. 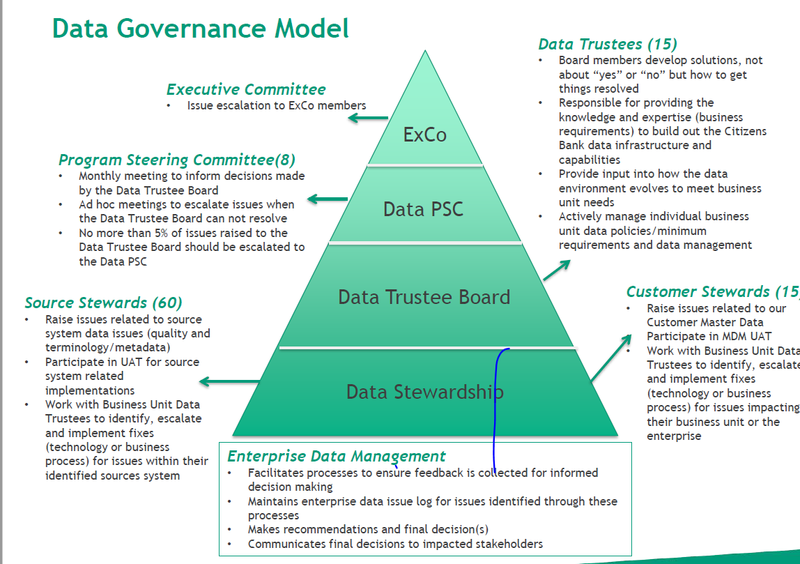 The PSC and the Data Trustees communicate these objectives to the Data Stewards, completing this bi-directional Governance Model. The Data Governance Model works with its Enterprise Data Engagement Model, with the people, processes and technologies. Data forms the center of all of this and the ability for people to search it and weave the information together. “Data Quality is a big part of this,” stated Cottone, drawing in Data Stewardship and Data Governance. “Ongoing engagements about Data Quality processes draw in Data Management.” Data Quality helps connect the Data Stewards in a way that propels the desired business outcomes, via co-filling, analyzing, proposing improvement, making changes, and monitoring the data. A Data Quality dashboard, for critical elements against each of the 75 systems, assist the Data Stewards “to resolve issues in a prioritized fashion.” Through the data, holding together the people, processes, and technology true Data Governance is achieved.